Marcus Cassianius Latinius Postumus was a soldier who rose to the rank of commander in the Rhine legions under the emperor Valerian I. During the reign of Valerian I, the economic condition within the Roman Empire began to collapse. Confidence in government simply collapse and the currency moved through a hyper-inflationary phase. The coinage of Rome fell dramatically in weight for the gold issues and silver virtually disappeared. The silver antoninianus was reduced to a crude bronze coin that was merely coated with a silver wash. In 259 AD, Postumus led a rebellion against the Emperor Gallienus, heir and son of Valerian I. Postumus succeeded in capturing Gaul, Spain and Britain beginning what would become known by historians as the first Gallic Empire that would last for almost a decade. 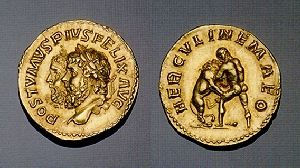 Postumus made a valant attempt at reforming the coinage within his new realm. At first, his coinage was struck in a full white metal. He reintroduced the bronze double sesterius and struck dupondius, as and a few denarii. However, as time passed, the financial decay that was taking place all around the Roman Empire was impossible to prevent even in his new Gallic Empire. The silver coinage of Postumus gradually declined and it too was reduced to a copper alloy with a silver wash.
Postumus was also one of the first emperors to portray himself with Hercules, unlike Commodus who may have believed himself to be Hercules. Nonetheless, Hercules was very much the Greek god who was similar to that of Christ insofar as he was the protector of the average man and the son of a great god in human form. Thus, the illustration above shows Postumus side by side with Hercules drawning the image of Postumus as the proector of the Gallic people from the corrupt and decaying Roman Empire. Postumus was also quite successful driving back the German tribes from the Rhine frontier. However, he was also able hold off Gallienus who made repeated attempts to recover the lost Roman provinces. In 268 AD, Laelianus led a rebellion against Postumus from within the Gallic Empire. However, Laelianus was quickly defeated destroyed. Unfortunately, Postumus broke with an old Roman tradition and he refused to allow his troops to sack the usurper’s city of Moguntiacum (Mainz). This decision proved to be disasterous and ultimately led to his own assassination. Pingback: true messenger "bulk message"